At Bay State Upholstery our mission is to provide quality customization for all furniture, while maintaining excellence, precision and craftsmanship. We pride ourselves in our excellent turn around times, as our customer you'll spend less time missing your furniture and more time enjoying it..
We re-upholster furniture, and many other items. We also offer a wide variety of fabrics and materials to choose from. Please check out our Services page for more information. Also, be sure to check out our Photos page to view a sample of the work Bay State Upholstery customers have come to expect. To get a free estimate or if you have questions/comments, call, email or fill out the form on our contact page. 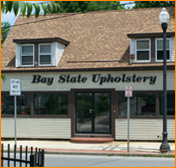 Bay State Upholstery provides skilled craftsmanship on all furniture reupholstered, built and altered for residential and commercial furniture. Copyright © 2011 Bay State Upholstery. All Rights Reserved.